There are only few Android apps developed by Apple, Inc. And Apple Music is one of them. In most situations, Apple only provides multimedia contents on iOS devices, but even Apple can't negelect the huge market of streaming music service from Android users. However, Apple Music Android app is only available for Android mobile phones with Android 4.3 or later, and not available for any Android tablets. If you are an Apple Music subscriber and want to enjoy Apple Music songs on an Android tablet, then Apple Music Converter will be your best helper. So far, Apple only released two Android apps which are Move to iOS and Apple Music. Move to iOS is designed for users to jump from Android to iOS, however, it was badly criticized for its bad function and it got lots of one-star review. The second Apple's Android app is Apple Music and Apple kept it as a beta version on Google Play for a long time. Apple Music Android app also got low ratings first, but Apple kept improving this app and now more and more Android users are also using Apple Music as their main streaming music service. Though Apple Music is available on Android, it's not for all Android devices and there are two restrictions. One is that Apple Music Android app is only available for Android 4.3 or later, and it's easy to understand and accept. However, the other is that Apple Music Android app can be installed only on Android mobile phones, but not on Android tablets. Some market analysts thought that Apple might be afraid of that availability of Apple Music on Android tablets might have an enormous impact on the sales of iPad. 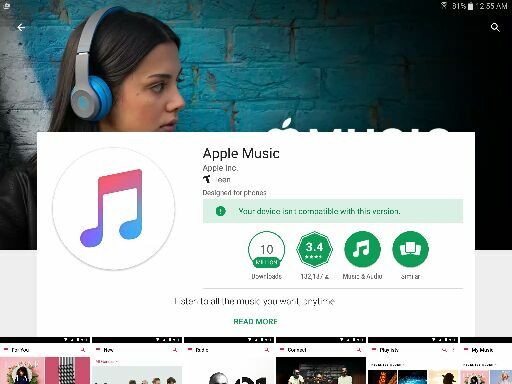 If you have an Android tablet like Samsung Galaxy Tab, Huawei Mediapad M3, Asus Zenpad, Lenovo Tab, Google Pixel C, etc., and try to install Apple Music Android app on your tablet, you will see a note that "Your device isn't compatible with this version" even your OS is Android 4.3 or later. So is there any way to enjoy Apple Music songs on Android tablet if you have subcribed Apple Music and using an Android tablet instead of iPad? The answer is yes, all you need to do is to convert Apple Music songs to all-purpose MP3 or M4A you can transfer and play on Android tablet. 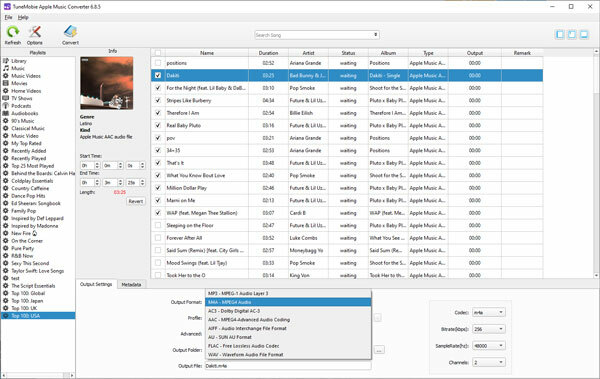 TuneMobie Apple Music Converter is a powerful iTunes audio DRM removal tool which can help you remove DRM protection from Apple Music songs, iTunes M4B audiobooks and Audible AA/AAX audiobooks, convert Apple Music and audiobooks to plain audio formats including MP3, M4A, AC3, AU, FLAC, AIFF and MKA. 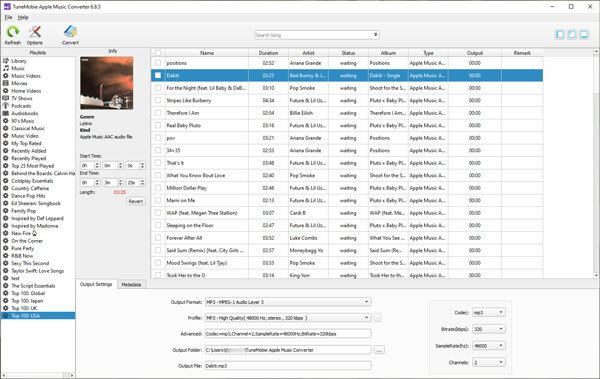 Apple Music Converter can also convert other iTunes compatible audio formats like MP3, M4A, WAV, AIFF, ALAC M4A, etc. as well as extract from DRM protected M4V movies, TV shows and music videos. You can also use it to extract audio from home videos in M4V, MP4, MOV format you add to iTunes library. Apple Music songs come with ID3 tags and metadata information like song tile, album, artist, track number, genre, artwork, etc. and all of them will be preserved in the output MP3/M4A files. Besides, you can also use ID3 tags and characters to rename and sort converted Apple Music songs in bulk. Apple Music Converter comes with intuitive and easy-to-use interface, and it's available on both Windows and Mac, fully compatible with latest Windows 10 and macOS Mojave. It's the best software solution to help you enjoy Apple Music songs on any Android tablets. Launch TuneMobie Apple Music Converter and iTunes will be automatically launched. iTunes library will be loaded and listed as playlists in the left panel of Apple Music Converter. Apple Music songs are listed in Music playlist and separated Apple Music playlists. Choose Apple Music by selecting the checkbox or click the top checkbox to select an entire playlist. Also, you can use built-in search box to locate the songs quickly. For Windows version, you don’t need to download Apple Music tracks to PC, but make sure you have add them to your iTunes library. 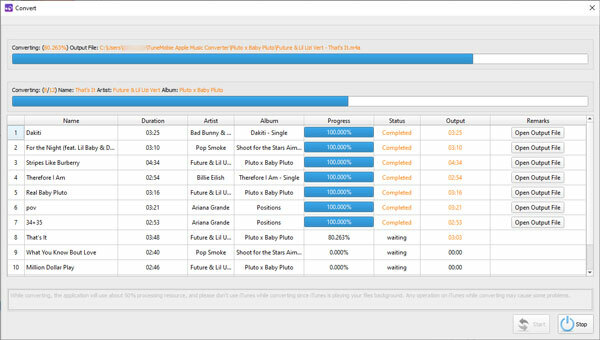 Apple Music Converter can directly convert them online. Depending on your need, you can choose MP3 or M4A for your Android tablet and select audio quality in profile list. If necessary, click Options to set conversion speed and file name. Now, simply click “Convert” button to start converting Apple Music tracks to MP3 or M4A. After conversion, you can click “Open output file” to locate converted Apple Music tracks. Now connect your Android tablet to computer with USB cable, then copy converted Apple Music songs to Music folder in your Android tablet or you can create a new folder to save the output songs. Make sure you have enabled USB debugging mode of your Android tablet first. Generally speaking, you can enable USB debugging mode by Settings > Developer Options > USB Debugging. 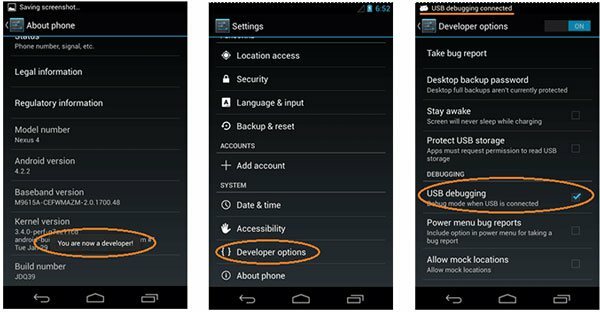 If you are using Android 4.2.x or higher Android OS, you may need to enable Developer Options by Settings > About Phone > Build number > Tap it 7 times to become developer first. By using Apple Music Converter, you can easily enjoy your favorite Apple Music songs on any Android tablets without limitation. You can also copy the output MP3/M4A songs to any Android mobile phones which are not compatible with Apple Music Android app, such as Android 2.x. When you are using Apple Music app on Android mobile phones, you are not able to set any offline Apple Music track as Android mobile ringtone, but by converting Apple Music to MP3/M4A, you can easily solve this problem as well. That is to say, Apple Music Converter helps you to play Apple Music songs on any Android devices. Have got an Android tablet and subscribed Apple Music? Do not hesitate to download Apple Music Converter to have a try!